I will return to the summer of 1984 when the series of work, which I titled “Stylized Landscapes”, began. After graduating from the Ontario College of Art (and Design University) in 1974, I produced mostly landscape paintings in watercolour, oil and acrylic that were quite representational in nature. However, my approach changed dramatically upon hearing a television news story on the environmental destruction that was being caused due to acid rain. Almost immediately, I responded to this by making some small pen sketches. These sketches were not based upon actual places, but rather were personal compositions based on memory. Blair T. Paul, AOCAD, OSA. The sketches were extremely spontaneous in nature, and intentionally lacked detail. Landforms were depicted in a very organic way, while the Man-made architectural elements that infringed upon the landscape were developed more as symbolic shapes. In some sketches the landscape is large and imposing, while the manmade element is small and seems to pose no threat. As my thinking broadened and the drawings began to evolve, the manmade structures became larger and more threatening, until the landscape had all but disappeared. With powerful juxtapositions in place in my pen sketches, I developed these into larger scale drawings using compressed charcoal on various types of paper. I wanted to keep the medium simple, yet dynamic in its potential. As a result, the work was bold and evocative, and I was offered several exhibitions including Carleton University. My work also appeared in a book titled “Art Carleton: The Carleton University Art Collection”, Roger Mesley, Carleton University Press, 1989. As the ideas progressed, I felt the need to move beyond the drawing medium I had been using, and represent my subject matter in acrylic paint. I also felt the need to present the work on a larger scale on canvas. The series continue to develop, and examples of this work may be seen in my recent book titled “On The Edge of Discovery: contemporary paintings in a personal context”, Penumbra Press, 2009. I wanted to create the same subject matter and emotional impact with these paintings as I had with my earlier charcoal drawings, so decided to work with a very restricted palette, sometimes using only two colours and white. There was no attempt to depict visual reality; these were all synthesized situations … compositions from within. I wanted the paintings to be dream-like in appearance, surreal; wanted to juxtapose architectural angles and organic contours and forms to create totally new relationships. I also wanted to work on a larger scale than I had done with the charcoal drawings as I felt that this too would bring about a greater visual impact for the viewer. Some of the paintings involved joining together two canvases to create an unusual yet useful shape to present the image upon. The theme of all these paintings is the ongoing clash between Nature and Man. We try to impose our will through technology, but Nature retaliates in her own ways to hold us back. Sometime through technological catastrophes we also destroy what we have so cleverly made. In the end, Nature will take back all we think we have gained. As humans we have tried to groom and control Nature, but to what effect? The negative consequences of some of our endeavours have been catastrophic. We have become somewhat more mindful of what we do, but more respect needs to be shown to the little planet we call home. Unlike the dinosaurs, we may have a choice in our own extinction. Through the carelessness of Mankind we have negatively affected the world we inhabit, and we must change our policies and philosophies if we wish to continue living on Earth. Greed has got us to the point we are now at. It’s time to re-think why we are here. Blair Thomas Paul was born in Almonte, Ontario, in 1951 and completed his formal art education at The Ontario College of Art and Design in Toronto in 1974. He studied art history at Carleton University, Ottawa, and in 1984 graduated from the Technological Studies Programme, Queen’s University in Kingston. Since then, he has been a fine art educator at various institutions as well as a practicing artist. 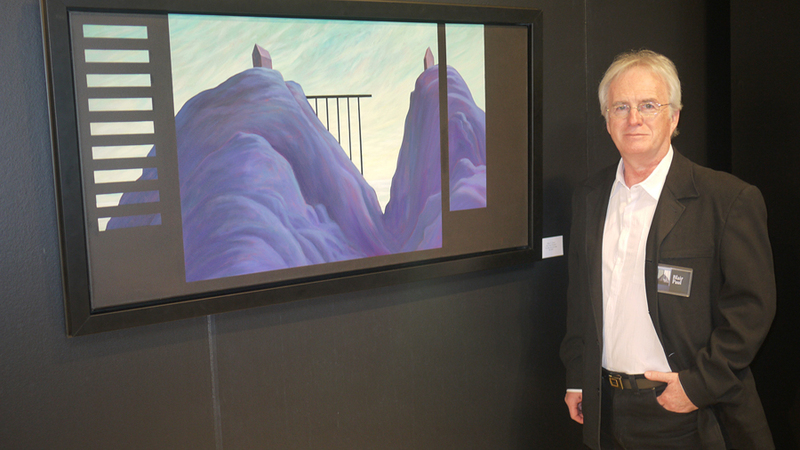 His work is in private, public and corporate collections in Canada and abroad. In 1986, he was unanimously elected to The Ontario Society of Artists in Toronto, and received an award of merit for a drawing entitled “CC 2000”. In 2006, he was the artist-in-residence at “AIR Vallauris”, France.